I actually rather like working on the car mostly (when the weather is good). 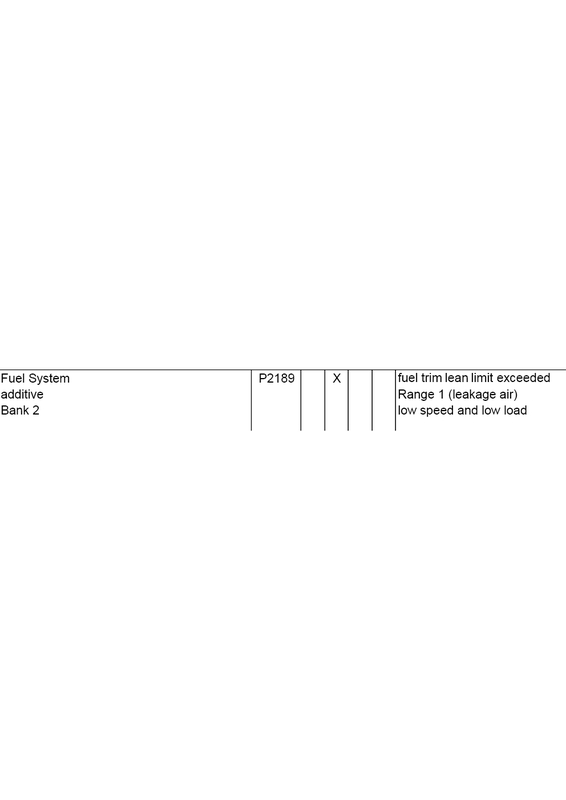 Having a bit of a search, it seems that P0441 relates to the fuel tank vent valve and that's also confirmed by the only noticeable symptom (that has always been there) in that it is hard to start immediately after filling up. Tank vent fault is pretty normal .. no real symptoms from it though and it wont generate an EML. you have an air leak bank 2 at idle , tank vent would and does effect both banks . There are some vacumn pipes at the rear of the mainifold .. worth haveing a look . mainifold gasket is pretty unusual to leak unless its been off .. then its pretty common ..
Any work done on the intake system recently ? No work done in that area since the Spring when the MAFs were changed. That was the last time a P2189 was generated. I suppose it's not impossible the MAF could have got a little oily as that's the side with the engine breather going into the air filter (and 143,000 on the clock). I guess I should change that and see what codes remain? Tank vent valve as said pretty normal , i often see it with no adverse effects and as per the video its often the valve . Fault code is mainly the air leak one .. the lambda sensor is reading too weak so its adding more fuel to compensate but cant add enough as its maxed out . Its either an air leak or possibly a lambda sensor .. not seen that before though . I think you would know ifyou had an exhaust leak near the lambda sensor but thats another way to get a lean fault code . At work then the first thing i would be doing is a smoke test .. a machine fills the inlet mainfold with smoke under pressure .. soon find a leak that way ! !